SOUTHERN PINES, NC – You can fix it, you can maintain it, but you can’t really restore it to what it once was. When it comes to owning a golf course, change is inevitable, and you can’t do much about it. This tortured slogan could literally apply anywhere, and in the world of golf course architecture, you’d think it’d be gospel etched at the top of every designer’s resume. But Pine Needles (in Southern Pines, North Carolina) proves the contrary -- that if you do the proper research in the right places, you really might be able to fix, maintain and restore it as well. 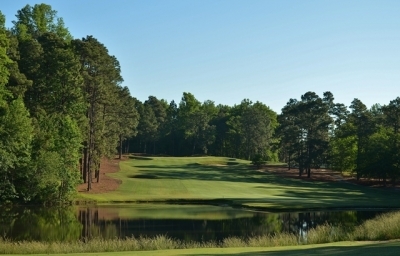 There isn't much water on the Pine Needles Course, but you'll have to fly some off the tee of the par four 4th hole. Needless to say, the same logic carries over to other courses as well, as demonstrated by the restoration of Pinehurst #2, host of the 2014 men's and women's U.S. Opens. In Pine Needles’ case, it’s a vintage Donald Ross golf course that was ‘brought back’ from historical obscurity. Most golf enthusiasts know the Ross story – he emigrated from Scotland in 1899, became the Head Golf Professional at Pinehurst in 1900, and went on to design over 400 golf courses until his death in 1948. The effects of time, weather and technology provide the caretakers of any Ross designed course a challenge – and a responsibility – to try and preserve what the master had created. But it’s more than making sure a course looks like it did all those years ago (Pine Needles opened in 1928), it’s maintaining the ‘brain work,’ the strategy that Ross instilled in all his golf courses. And if you’re serious about doing that, you’ve got to do a little homework along the way. 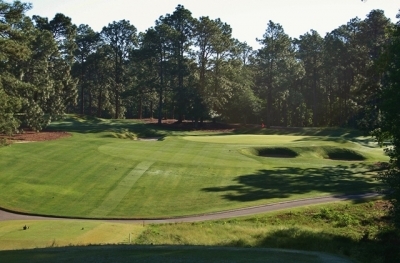 The keepers of Pine Needles, site of three US Women’s Opens (1996, 2001 and 2007) were thrilled with the players’ reactions to the course when the events were held there. But they also realized that if it was to be ready for its next ‘major’ challenge, the layout needed some significant upgrade work... or perhaps more fitting, retrograde work. Looking from behind the flag of the beautiful par four 17th hole. 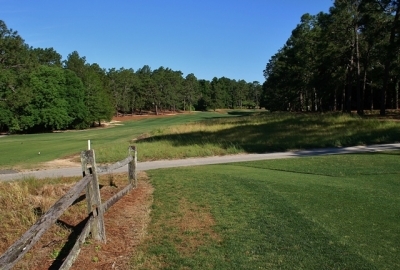 The 2013 restoration of Pine Needles' sister course, Mid Pines, will be addressed in a separate story. Pine trees and a well defined hitting area -- trademarks of Pine Needles. Here, the 8th tee. “So we spent a couple years researching the project and hired John Fought to oversee the work for us. He came in and we basically tore every blade of grass off the entire course and completely redid it – from the tip of number one tee until the 18th green. We reworked every fairway, every bunker, and every green. We ended up with eight fewer bunkers than when we started – because we found old Ross bunkers that had been covered over, and we also found bunkers that had been added that were not part of his original design that were removed,” Gilmore added. The nice thing about restoring a golf course – especially a Donald Ross Classic – is that it’s not like trying to piece together a mystery by sifting for artifacts at an archeological site. Not only is there physical evidence of what once had been there, but there’s a more than adequate written record of the original Pine Needles – much of it penned by Ross himself. The papers on the course were found just down the road in the Tufts Archives of the Givens Memorial Library in the Village of Pinehurst. 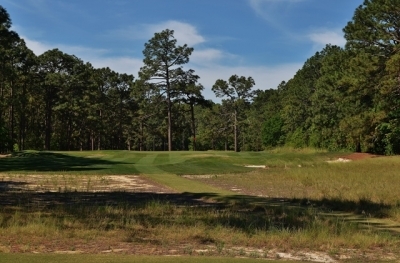 Pine Needles was built by the Tufts family (shortly after Mid Pines was finished, across the road), which means it has much the same legacy as its older relatives over at Pinehurst Resort. Ross was an employee of the resort at the time, and left extensive notes on what he did at Pine Needles. There was also period aerial photography available to show what was where. All and all, there was a pretty thorough instruction manual for how to put the original Ross golf course back together. Strategy is demanded at Pine Needles on all shots. It may look wide open off the tee, but if you want the best angle into the green, you'd better challenge the fairway bunker. Here, the par four 11th hole. And John Fought was just the right man to assemble the pieces. A former professional player, Fought was selected because of his sensitivity and familiarity with Ross’s work. He won the 1977 US Amateur Championship on a Ross course (Aronomink in Pennsylvania), and has a reputation for respecting the Scotsman’s work. More than that, Fought would devote the personal attention to the project that it demanded – making weekly site visits to finalize every detail that went into it. For a restoration job like this, someone needs to okay every bump and wiggle. Fought was happy to devote the loving care. He’d also known the Bell family (Pine Needles’ owners, who purchased the property in 1953) for over twenty years. That couldn’t hurt. The par three 5th hole. 218 yards from the back tees, and it looks just as long as the yardage would indicate. Fought said it also needed to be ‘upsized’ in order to play in scale with today’s equipment. That involved creating more yardage and repositioning some of the hazards to account for the way the modern game is played. Part of that modern touch being entirely new turf blends – the latest and best that science can provide for each area’s unique growing characteristics. 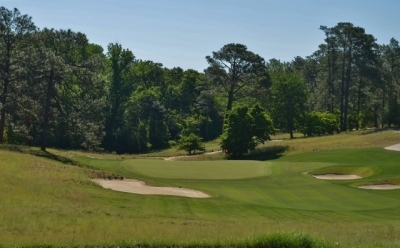 The Pine Needles group selected A1 Bentgrass for the greens (a very dense grass that requires a low mowing cut, but it's also heat and humidity tolerant), and Tifsport Bermuda grass for fairways and playing areas. The par five 10th hole defines risk-reward. 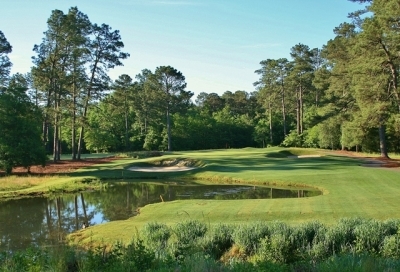 Long hitters can try and go over the pine trees on the left, which will certainly allow for a try at the green in two. Having seen it in May of 2014, the course looked like a classic old-style gem that was quite mature. It remains highly playable and in very good shape. 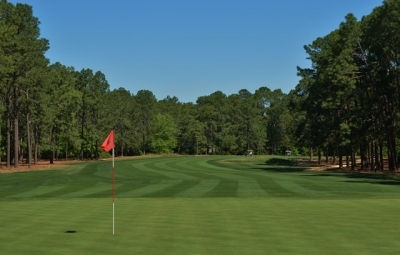 One great thing about Pine Needles (and most courses in the area) is… the pine trees themselves. Since most of the tall greenery surrounding the fairways is in the form of pine trees, when you’re not on green grass, you’re probably on pine straw. It’s not the easiest surface to hit off of, if you’re not used to it, but at least the average resort player won’t spend all day searching for golf balls. 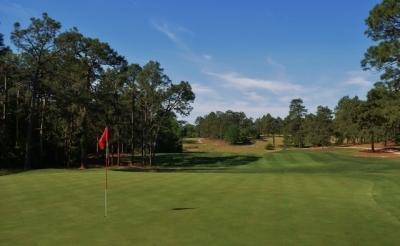 In addition to the restoration effort, you’ll grasp the significance of the place when you’re visiting -- Pine Needles is more than just a great golf course. Some of the greatest players in the world have tested it. The par three 3rd hole is Pine Needles' shortest, but it's still no push-over. True, Pine Needles is friendly to the ladies. But as previously alluded to, a lot of effort went into lengthening the course to challenge and interest the men as well. Gilmore says they created a course than can be played at over 7,000 yards – while also shortening it some for women (and the regular men’s tees) at the same time. The course plays pretty long from the back tees, with a number of difficult carries. Pine Needles probably isn’t long enough to hold a major men’s competition, but it’s certainly a struggle for all but the very top players. For those seeking the ‘real’ Ross experience, Gilmore suggests choosing the Ross tees that play at 6,435 yards, the original back tees for the course when it opened. You’ll be hitting from the same boxes that they did all those years ago -- thankfully, you’ve got modern shafts and golf balls to make it a little easier. Pine Needles ‘looks’ like a real Ross course as well, even though you might not realize it right off, in all respects. Sure, there are the closely mown swales around the greens, which harkens back to Ross’s Scottish background, but the bunkers also provide telltale signs. “During our research, we discovered that Ross never put sand on his bunker faces – he always grassed them down. They were basically flat on the bottom with grass faces, so we built them back that way -- it kind of looks like you’re playing in Great Britain,” Gilmore explained. The par three 13th hole is downhill and relatively open to the breeze, making club selection tricky. Pine Needles does not resemble the sandy landscapes of the restored Pinehurst #2 and Mid Pines -- but make no mistake, there's plenty of authenticity to be found. There’s also not much water at Pine Needles, which is another Ross characteristic. Ross felt that water was too penal, so his philosophy was to challenge players via bunker placement and force you to be creative around the greens. There are three ponds on the course, but all are navigable off the tee, and certainly won’t come into play (or shouldn’t). Our favorite hole was the one that gets most of the photographic attention, the short par three third hole. Only 145 yards in length, it’s nonetheless well guarded by sand and visually presents a pretty small target from the tee box. One of Pine Needles’ three ponds is on this hole, which adds to its postcard quality looks, but doesn’t influence your thinking on club selection. The green is also severely sloped from back to front, so don’t let the yardage fool you – par’s a good score on this little hole. Looking at the 7th green, you get an idea of the comfortable wide-space feeling you get at Pine Needles. The post-restoration Pine Needles shares one thing with the balance of Ross’s lifelong golf contributions – it’s fun to play. Friendly enough for common players, yet difficult for good players, it’s a good time for everyone. Something that Ross’s legacy is proud to grab hold of. 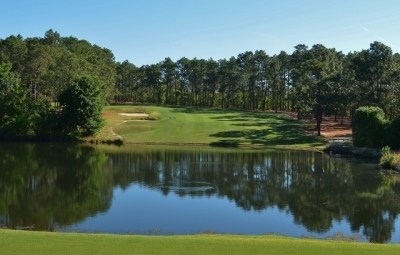 Visiting Pine Needles and Mid Pines is more than just a golf experience. Though we’d say it’s primarily for golfers (the non-golf activities are somewhat limited), it’s hardly family un-friendly. Finishing up on the 18th green -- you'll get a great feeling of accomplishment knowing you've played a 'real' Donald Ross course. The Pine Needles Lodge features 74 recently renovated sleeping rooms, including some suites. Most overlook the golf course. There are 65 rooms across the road at the Georgian-style Mid Pines Inn, along with 45 more rooms in seven villas. 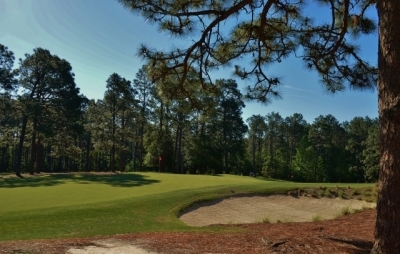 Pine Needles also offers three lodges, located along the 18th fairway. These are perfect for large groups, business retreats or family reunions. The renovated buildings are older with solid construction, but what struck us the most was the sheer size of the rooms. Our room at the Pine Needles Lodge contained a large space for our sleeping quarters and a loft, but also ample closet space for an extended stay, and a sitting room where you could entertain a host of visitors. We also appreciated the large high definition TV and wireless internet. You won’t want for dining as well, as both Pine Needles and Mid Pines have dining rooms open for breakfast, lunch and dinner, and lounges for relaxing after a day spent on the links. 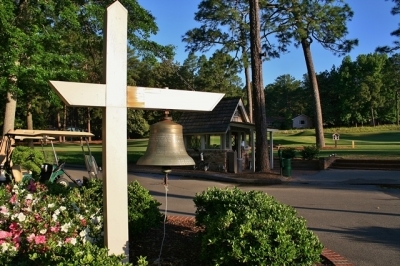 What’s especially noteworthy about staying at Pine Needles was the service and the attitude of the staff. Here’s where you’ll feel the presence of Proprietor Peggy Kirk Bell – every employee we came into contact with was graced and open with warm southern hospitality, and this includes the pro shop staff. If you don’t feel welcome here, well, you might not feel comfortable anywhere. To illustrate, our non-golfing members of the party (including two teenagers) arrived late for the breakfast serving, after posted hours. The staff extended the hours to accommodate them – something that was very much appreciated. The par three 16th hole. 2005 US Open Champion Michael Campbell celebrated his victory with Mrs. Bell and the staff (check out the photos when you’re there). 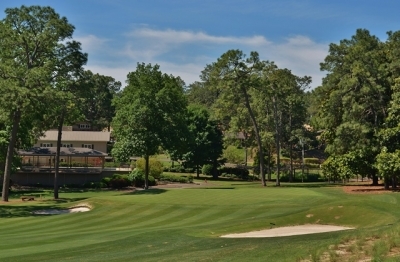 While other players couldn’t wait to get out of town, there was a reason why Campbell stayed – and if you stay at Pine Needles or Mid Pines, you’ll discover why you’ll want to hang around, too.